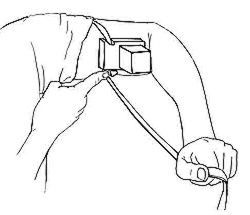 Roll up your sleeve so that the tefillin is in direct contact with your arm. Put your arm through the loop formed by the knotted strap. Place the black box up on your bicep, just below the halfway point between the shoulder and the elbow, right across from your heart.